Preheat oven to 350°F. 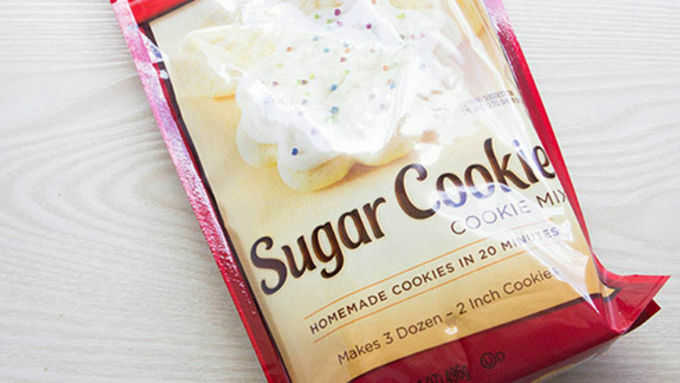 In a large bowl, combine Betty Crocker™ Sugar Cookie Mix, butter, powdered sugar, and water. Mix together, kneading with clean hands until a firm dough forms. Spray a mini popover pan with nonstick baking spray. 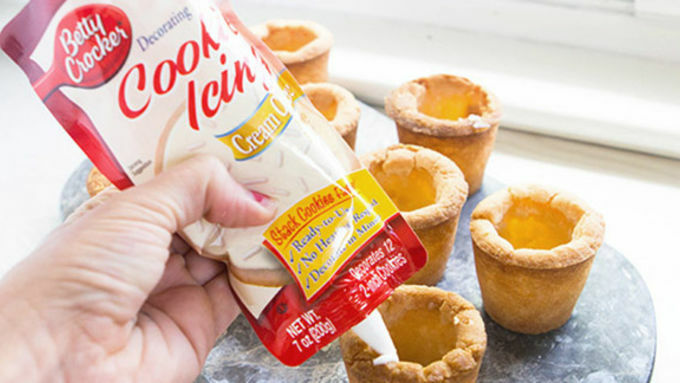 Press approximately 2 1/2 tablespoons of dough into 9 popover cups, pressing the dough against the side of the cups with a rolling pin to form a shot glass shape. This shape will actually fill in as it cooks, but don't panic. You're measuring the amount of dough, not trying to make perfect cups with the dough. Bake the cups for 9-11 minutes, or until the edges of the dough begin to puff up. Pull the popover pan out of the oven and press the bottom of a rolling pin into the center of each cup to indent into cup shapes. Return to oven for another 2-4 minutes until the top edges of the cookies are golden brown. Remove from oven. Use a small spoon to gently carve out any dough that has puffed into the center of your shortbread shot glasses, taking care to not spoon too much out and cause a tear in your shot glass. The dough will still be slightly soft, and that's okay! It'll set up as it goes. While the cookie cups are baking, prepare the RumChata™ jello shots: In a large bowl, whisk together gelatin and warm water until dissolved. 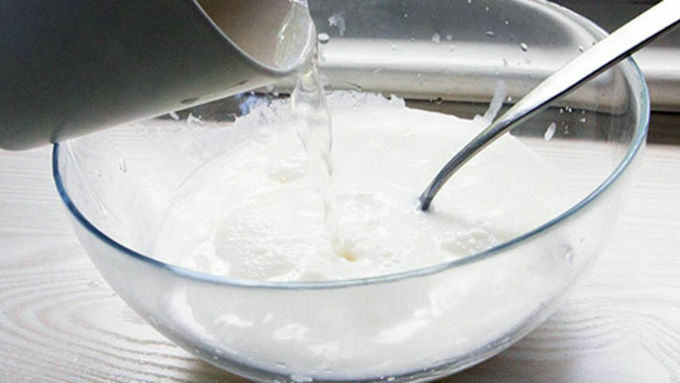 Whisk in RumChata. Cover with plastic wrap and place in the fridge until cookies are ready to fill. Two minutes before the cookie shot glasses come out of the oven, prepare the sugar glaze, which will be brushed on the insides of the cookie cups to prevent the jello shots from leaking through. 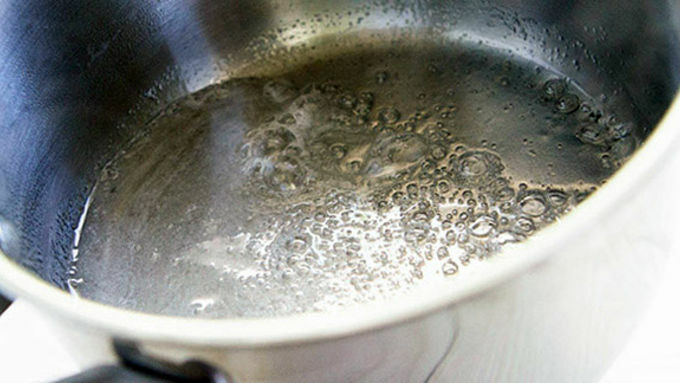 Heat together 1/3 cup of sugar and 1/4 cup of water until boiling. Allow to boil 60 seconds, stirring constantly. 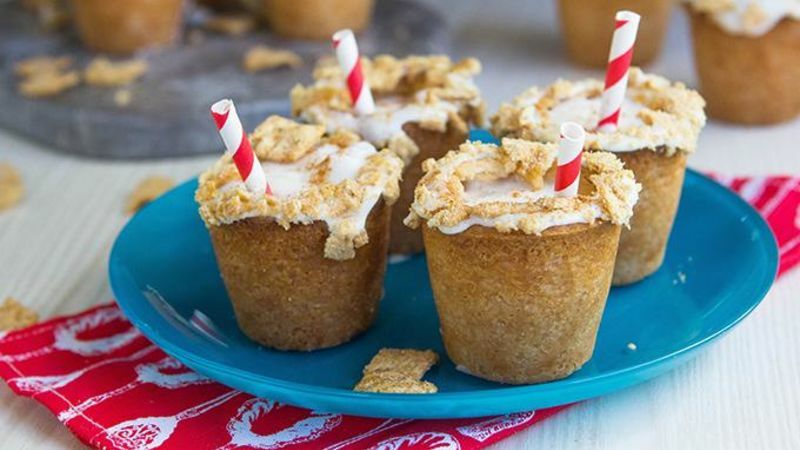 Once the cookie shot glasses have the centers removed from them, use a basting brush and coat the inside of each shot glass with the sugar glaze. Place in freezer for 10 minutes and allow to harden. Top each shot glass with Betty Crocker cookie icing. 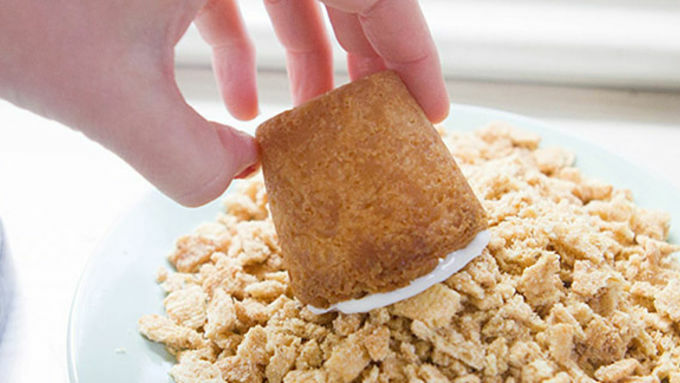 Then gently press the cookies into crushed Cinnamon Toast Crunch cereal. 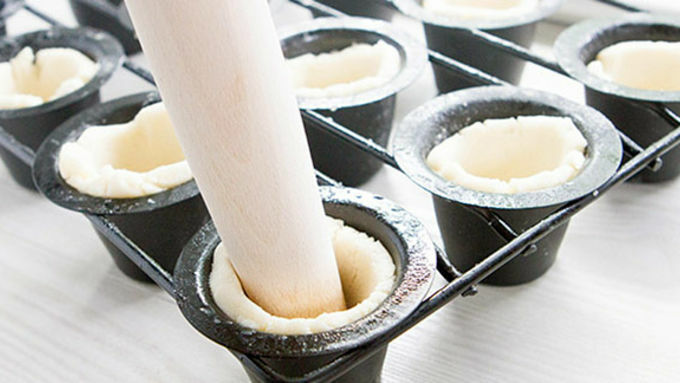 Once the insides of the cookie shot glasses are glazed and the glaze has hardened, remove the jello shot mixture from the refrigerator and whisk to smooth it. Fill the cookie cups with the jello shot mixture. Place a small paper straw into the jello mixture for a cute garnish. Cover and refrigerate until ready to serve. Serve within 4 hours. Enjoy! Cookie shot glasses? Brilliant! 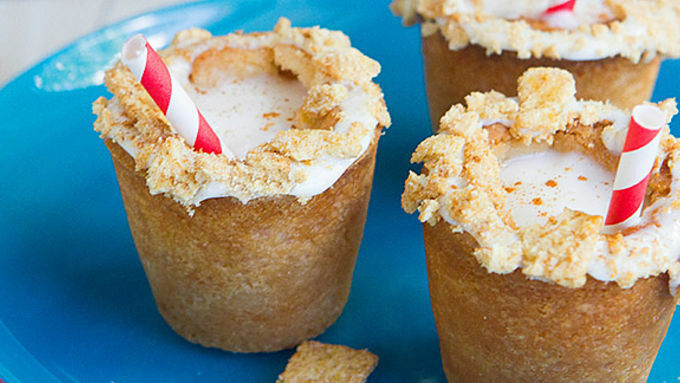 And they're even better when filled with RumChata™ jello shots. When it comes to epic party throwing, we know a thing or two about jello shots. 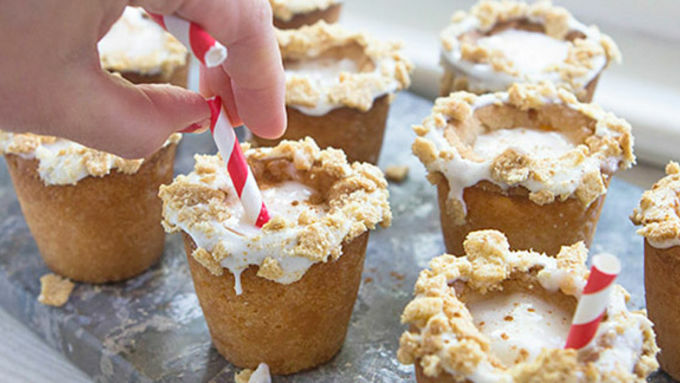 So naturally, when cookie shot glasses started making an appearance on the scene, we were all like…ooooh yeahhhhh. So we made shot glasses from some easy cookie mix, filled ‘em with RumChata shots, and called up a few friends. Because this level of epicness deserves to be celebrated. 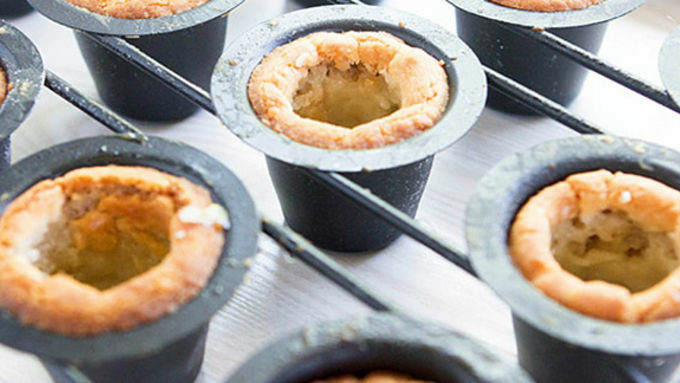 The shot glasses get made in a mini popover pan. You can nab one of these pans online, or find them in kitchenware stores. 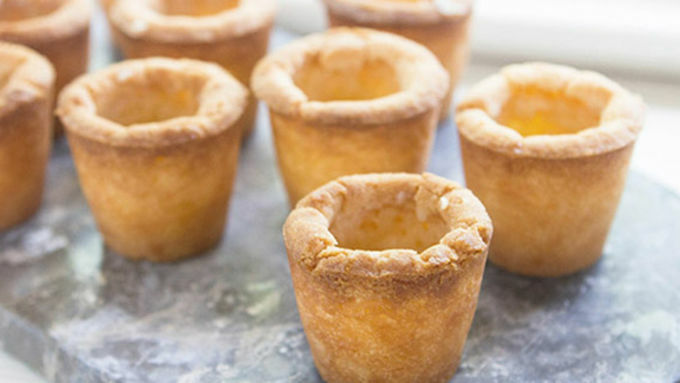 It’s worth the initial investment because even if you’ve never made a mini popover, you’ll forever want to make homemade shot glasses after seeing how fun this gets. A small, snipped paper straw inside each glass makes these jello shots really look the part. (No, you won't sip through them -- they're purely for fun!) Refrigerate your shots until they’re firm, then nibble them up! These shots work best when served within 4-6 hours of prepping. Just so the soft stuff stays soft and the firm stuff stays firm, and the shot stuffs stay scrumptious!